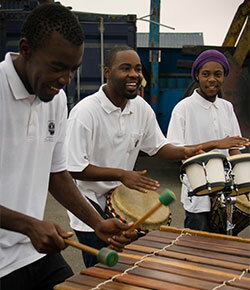 Drum Cafe Namibia is based in Windhoek and also operates from the coastal towns of Swakopmund and Walvis Bay. Open or close your conference or revitalize delegates between presentations with interactive drumming or a boom whacker session. A great alternative to a keynote address. 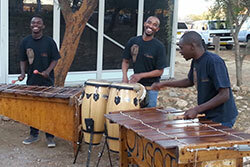 Powerful drumming and marimba performances by our African music group Ongoma. Ideal as a feature show or as atmospheric background entertainment. The perfect soundtrack for corporate functions, diplomatic parties or private events. We also offer poi and fire spinning performances with live drumming. 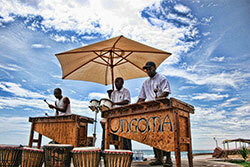 Ongoma was founded in 2002 by Namibian tour guide Volker Röder and fellow Namibian drummers. 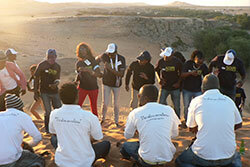 What started off with occasional informal drumming circles or performances in beach bars in the coastal town of Swakopmund quickly developed into a sought-after entertainment product for the corporate market. 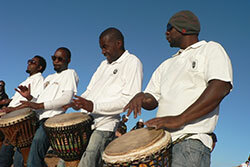 When Volker tragically lost his fight against cancer in 2012, Ongoma had long relocated to the Namibian capital Windhoek as a fully-fledged entertainment company, offering interactive drumming for teambuilding and traditional African music performances as well as facilitating big scale live music events. Ongoma had also published its debut music album, The Natives are Restless. Since Volker’s passing, the company was registered as The Ongoma Trust and is administered by his wife, Irmi Röder, and one of the founding members of Ongoma, Desmond Nasima. In December 2015, Ongoma joined the international Drum Café family and is now trading as Drum Café Namibia.